June is National Candy Month, which means it's the perfect time to let yourself indulge in some delicious sweets. One of my personal favorite kinds of candy? Jelly beans! After all, what's not to like? They're sweet, they come in a ton of flavors, and best of all, they pair well with one of my other favorite things: wine. That's right — jelly bean and wine pairings are totally a thing. You may not have thought of it before, but jelly beans and wine actually work great together — as long as you find the right combination, that is. Luckily for us, we have some help nailing down the best pairings. Gimbal's Fine Candies, the company that sells allergy-free candies with more than 40 nut- and gluten-less flavors, has come up with this handy chart, detailing which flavors of jelly bean goes with which type of wine. As detailed below, sweet, fruity flavors, like green apple, pomegranate, and kiwi strawberry smoothie, pair best with Rieslings. Meanwhile, citrusy flavors, like lemon and key lime, go well with Pinot Gris and Sauvignon Blanc. Prefer red wine? Don't worry, there are plenty of delicious flavors that pair well with that too. 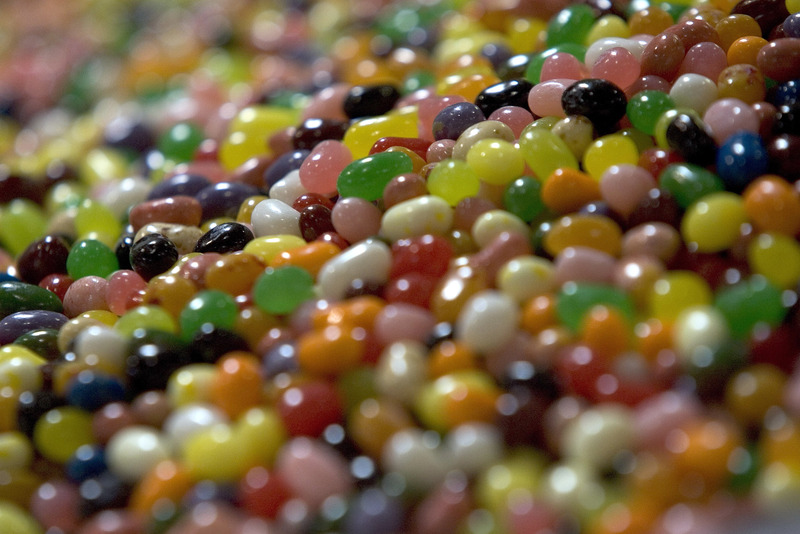 As the chart highlights, stronger, more bitter flavors like chocolate and java will be complemented by Cabernet, while a glass of Merlot will round out the notes in jelly bean flavors like toasted marshmallows and honey. If you'd rather drink a little bubbly, try pairing it with dessert-flavored candies, like strawberry cheese cake and ice cream cake. So what are you waiting for? Pick your favorite flavor of jelly bean or wine, and celebrate National Candy Month by finding the best pairing for you below. Whichever combination you choose, it's sure to be delicious.